Adventures In Uglyworld: Uglyworld #200 - Cookies to Celebrate! Uglyworld #200 - Cookies to Celebrate!, originally uploaded by www.bazpics.com. This morning before leaving the hotel to go to the customer site I asked Wage and Ice-Bat what they would like to do for the 200th Uglydoll picture - at first they threw a few half-baked suggestions into the hat and then Ice-Bat asked if he could speak to Babo (as Babo is normally one of the uglies who comes up with the best ideas). Ice-Bat was only on the phone for about 20 seconds when he hung up, I asked him if he had a plan? He said, "Babo is so smart, it was so obvious that we couldn't see it ourselves for looking - COOKIES!!!" So this evening after work we took a walk down to a local supermarket where I left the pair of uglies to choose what they wanted - there were so many to choose from but eventually when Ice-Bat hovered over the Nippon biscuits (easiest way to explain them is a chocolate rice krispies cake) Wage was sold on the idea. 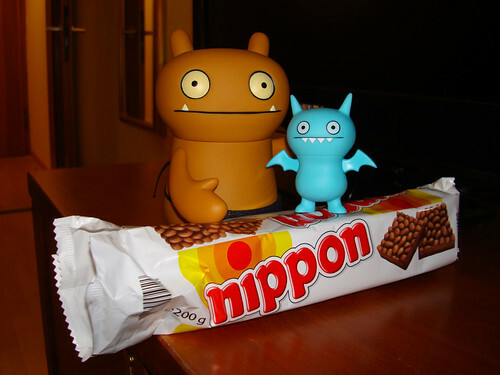 I made sure that before they could open the packet that they had to pose for the 200th Uglydoll picture I've taken, phew!